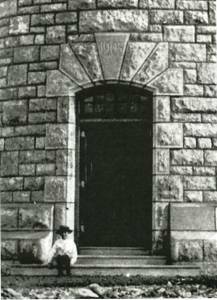 Even though the building of the lighthouse was completed in 1903, it was not lit until the Lighthouse Keepers' Cottages were completed in April of 1904. 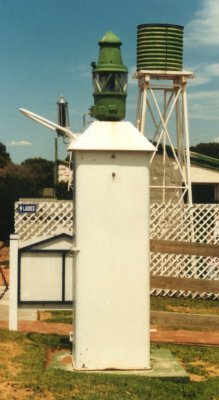 The eighth lighthouse built in the state and only the third landfall light at a time when there was a rush of lighthouses being built around the coast of Australia. Separated by 100 years, children still find Lighthouse's fascinating. 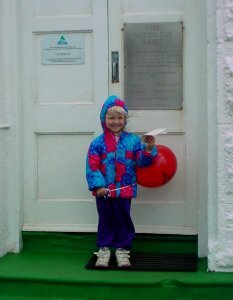 Alexandra had made a Birthday card for the Lighthouse's 100th Btirthday and brought it out to give to the custodian of the light Leon Chidlow. 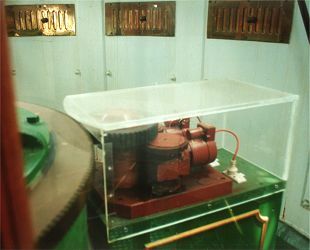 Chance Bros 4.6 m lantern floating in a bath of mercury, originally driven by clockwork mechanism. The Keepers' cottages are currently not available. 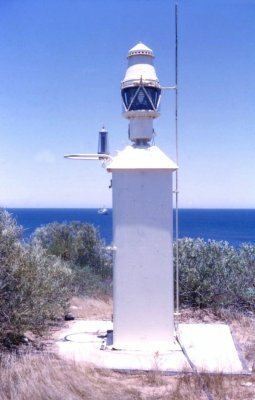 1996 saw the last Lighthouse Keeper in Western Australia replaced by fully automatic operation at Cape Naturaliste. 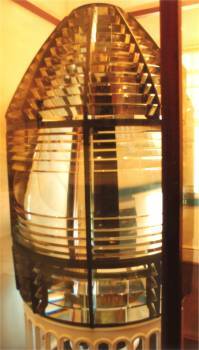 The 4.6 metre diameter Prism Crystal lantern and a first order 920mm focal radius lens, were made by Chance Bros. in Birmingham, England. It is now conservatively valued at over $5 million. 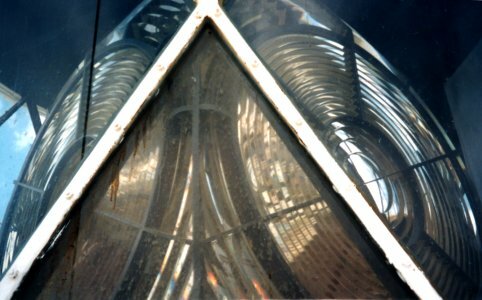 Currently lit by a 120volt 1000watt tungsten halogen globe, the 12.5 tonne lens magnifies the globe to just under 1 million candlepower which is visible for 25 nautical miles (46km). 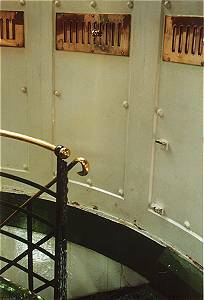 The original light and turntable which still floats on a bath of mercury, was turned by a clockwork mechanism, which needed rewinding every 50 - 60 minutes at night. Now fully automated (July 1978) the lens continues turning all day. 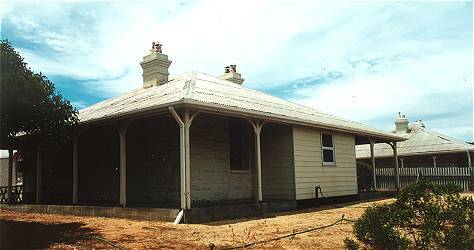 The limestone used for both the tower and the cottages, was quarried near Bunker Bay. 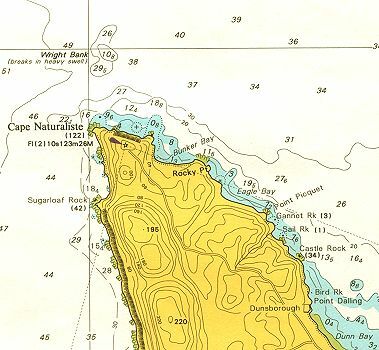 Prior to the building of the Lighthouse, some 12 ships had become wrecked among the strong currents and dangerous reefs surrounding the sharp point. Baudin, an early 19th century French explorer named both Cape Naturaliste and Geographe Bay after his two ships. Located on a 100 metre cliff, the 19 metre high tower has become a valued tourist attraction and prime whale watching site. 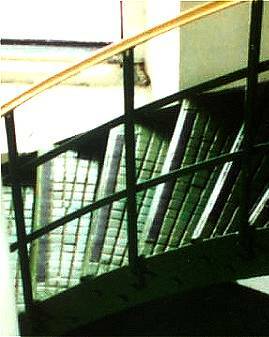 The staircase curves around the central column in which the clockwork driven weight would have travelled. 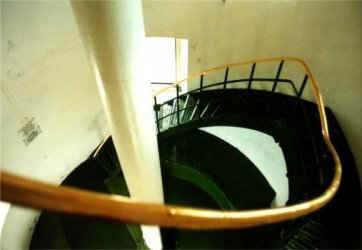 The steps inside the lighthouse are unique in that they are made from teak blocks dowelled together and set end grain up for greater durability. 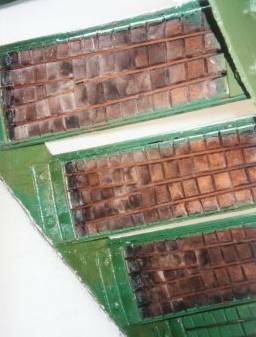 Internal fittings still in prime condition. View of the three cottages and outbuildings from the top of the Lighthouse. 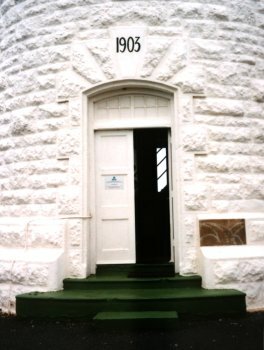 The closest to the Lighthouse is used as the custodian's residence. Identical in shape and layout, some changes have been made to individual cottages over time. The middle cottage is used as a Museum and visitor centre. 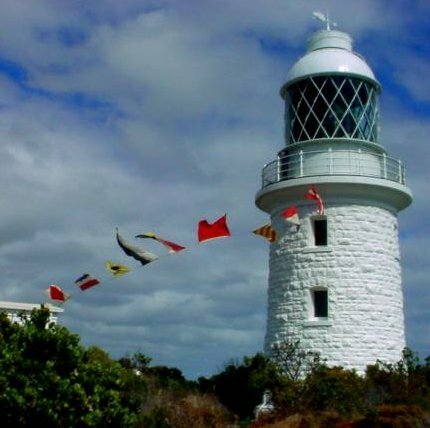 Australia Post celebrated the Lighthouses of Australia with a series of four stamps featuring the historic Macquarie, Troubridge Island, Cape Bruny and Cape Naturaliste Lighthouses. Opposite is the first day of issue postcard dated 12 March 2002, which was franked with a stamp from Beacon 6472, a wheatbelt town in WA - far from the coast. 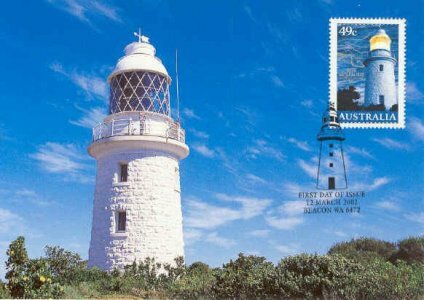 The Vlamingh Head Lighthouse at Exmouth, WA, (photos by John Ibbotson), was also used in the promotion of the stamp issue. 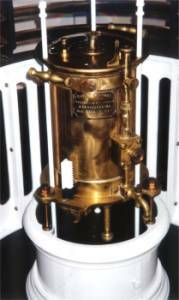 The original Jarman Island light and mechanism are on show in the Museum which is housed in the middle cottage. 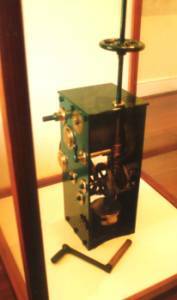 In the grounds of the museum cottage you can also see the original self contained acetylene beacon from Great Sandy Island. 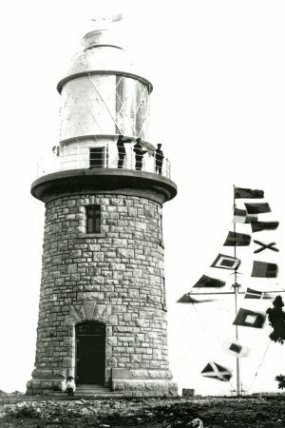 The photo on the left (pre 1971) showing the light in its original location, was taken by Ralph Meakins, a mechanical engineer on the MV Cape Don, which travelled the coast of WA to service the lighthouses and deliver supplies to the Keepers and their families. 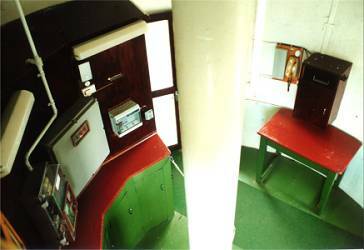 The MV Cape Don is currently undergoing renovation in Newcastle with volunteer help provided by the MV Cape Don Society. 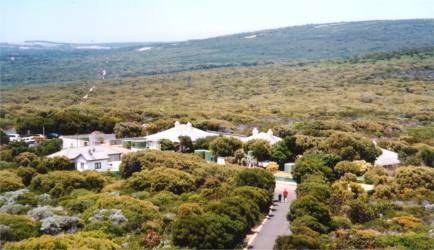 Goegraphe Bay Tourism Association - including information on the various walk trails around the Cape. South West Life - featuring stories of the Keepers.